The sprinklers outside the California's state Capitol are off and the lawn is withering, the lemon- and cucumber-infused "water stations'' at the state pension building are gone, and prison inmates are taking shorter showers while campers at some popular parks can't take them at all. In ways big and small, the state government is conserving water to try to meet Gov. Jerry Brown's request that everyone, from residents to businesses to state agencies, reduce their use by 20 percent. Still, six months after Brown declared a water emergency, few state agencies know whether their conservation efforts are meeting the mark. They are not required to compare water consumption this year to last, and few have, The Associated Press found. The AP asked the 11 agencies or departments that use the most water how their consumption over the first half of this year compared to the same period in 2013. Only four could provide comprehensive data for water use in buildings they manage, in some cases taking several weeks to produce the information. Others pulled a smattering of utility bills from a few sites only after being contacted, data they acknowledged was not sufficient to gauge the effectiveness of conservation efforts. One of the largest water users, the California Department of Transportation, provided 2014 data for water accounts in four cities and one county, and couldn't provide any 2013 numbers. The agency has more than 7,500 accounts. "Obviously, we have quite a bit more data to review,'' spokesman Mark Dinger emailed. The agency believes it will meet or exceed the governor's target, Dinger said. The lack of accounting by Caltrans and other agencies is another example of how the state is struggling to keep track of water use. A recent AP story detailed how state regulators do not know how many trillions of gallons have been diverted by corporations, agricultural concerns and others that have "senior water rights'' entitling them to free water. With California in the grip of its worst drought in a generation, Brown declared an emergency on Jan. 17 and asked residents and agencies to trim usage. There is no penalty for failure to comply. Meanwhile, residents can face fines from local authorities for wasting water. 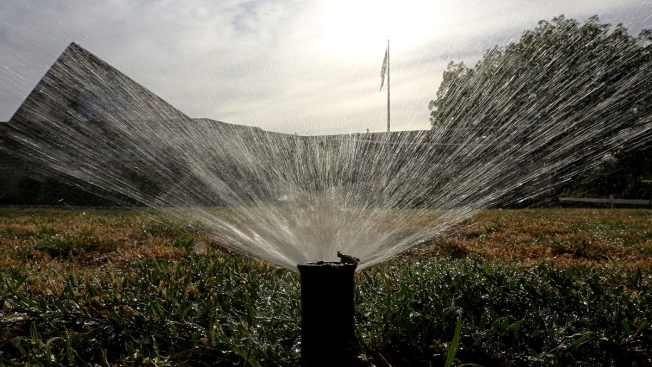 The State Water Resources Control Board, frustrated that consumption statewide increased 1 percent in May from a year ago, voted this month to impose fines up to $500 a day for wasteful outdoor water use such as excessive lawn watering and sidewalk washing. Tracking water usage across the state's sprawling government is not like checking a residential utility bill, state officials said. With thousands of accounts billed at various times and utilities measuring consumption in various ways, the task of compiling data has proven complex, said Brian Ferguson, spokesman for the Department of General Services, which is helping coordinate the state's drought response. "There's not just an iPad app we can turn on to do this,'' Ferguson said. Under a 2012 executive order, by March 1, state agencies were supposed to have cataloged site-by-site water use from 2013 in a central database. That data entry fell behind schedule, but is nearly complete, Ferguson said. Neither that executive order nor Brown's emergency declaration required agencies to track 2014 usage in real time, he said. The 2014 analysis doesn't need to happen until early 2015. Other than saying in a written statement that ``more aggressive action will be needed'' to save water, Brown's office referred questions to the Department of General Services, which said the available data suggest state agencies are working hard to meet Brown's goal. The Department of State Hospitals, with five campuses that provide mental health care to about 5,600 patients at any given time, trimmed water use by 18 percent, to 139 million gallons in 2014. The conservation rate increased as the year went on. Water use dropped by 21 percent, to 99 million gallons, at the four Department of Developmental Services' facilities where 1,200 people with developmental disabilities live. The Department of Veterans Affairs cut use 11 percent, to 82 million gallons at eight veterans' residences plus headquarters and a cemetery. The Employment Development Department, which provides unemployment insurance and collects payroll taxes, used more than 4.5 million gallons in 2014, a 32 percent drop. The agency said it could provide data for 26 facilities, not including 158 sites it leases or occupies in buildings run by another state agency. In addition, two provided data for all facilities but a limited timeframe. The Department of Corrections and Rehabilitation sent 2014 usage data for all 34 state prisons, but only for one month in 2013. Data from Cal Expo, the fair and event space in Sacramento, did not cover the first two-plus months of each year. The remaining agencies provided just a snapshot of use from a small fraction of their sites. They were: Caltrans; the California Highway Patrol; and the departments of General Services, Water Resources and Parks and Recreation. Several agencies said conservation would have been greater but for one-time construction projects. Some pointed out that new cuts can be a challenge because prior efforts already eliminated some water waste.